In this short report I write about “Meet the British”. The short meeting took place on November the 13th between 4 and 5 p.m. in one of our rooms in our school. Monica, who is British, introduced herself as a local BID-Welcome Ambassador, which is a special job, where she walks through the city every day until 6.30 p.m. and help tourists, e. g. if they get lost. She also visits all the local shops, most of which are located in the city centre, and talks to shop assistants. She´s right there to solve their problems. Monica herself gave the impression of being a very sociable, diligent and intelligent person who feels a responsibility for her job and enjoys it. Most of all I liked the way she integrated herself into the local society. I enjoy the company of people who are trying to be beneficial to their local community and hence creating better conditions and friendly environment for all of us. Although Monica originally comes from Romania, her English is very good and she tries to provide the best possible pronunciation, because she wants to be understood. Not everybody is like that. I´m glad I was there, although I hadn’t planned to because everything´s busy here. I´m lucky to have had the possibility of taking one important lesson with me: in this country everybody has a chance to become an accepted member of society if they actively try and want to in the place they´ve decided to live in, to stay safe, and make it a friendly place for everybody else including themselves. Thank you Eliska for the nice presentation. It was a pleasure meeting you and I am sure you will do well with your English! Feel free to get in touch with me anytime. I wish you all the best! Thanks for your report Eliska. I’m glad that you enjoyed meeting Monica, and I hope Monica will come to school to talk to the students again . 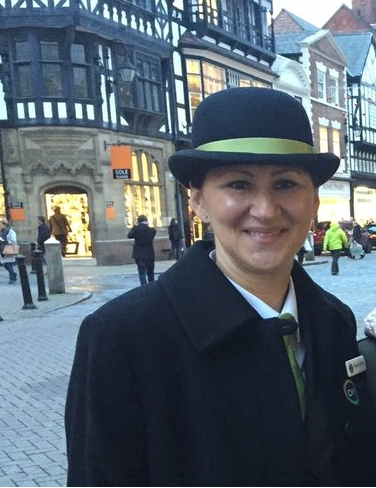 Hopefully students reading this post will feel that they are able to talk to Monica and her fellow Welcome Ambassadors if they need and help and advice while they are out and about in Chester.